One of the things I often purchase at Aldi’s at least once per month are their Pork Tenderloins. They’re inexpensive, just the right size for our family (I buy two if we’re having company for dinner) and they come in an “original” flavor, as well as a couple of other flavors. I like the original flavor because we can do whatever we want to the pork. Sometimes we use teriyaki, sometimes we do barbeque, and sometimes we do a simple pork marinade. Today I’m sharing the recipe with you for the Pork Marinade. Of course, it’s a recipe from my mom and the instructions say “Also good on steak,” and “Don’t double.” So don’t. Throw it all in a bag and you’re good to go. That’s all there is to it! Super easy. Throw it all in a ziploc bag or tupperware marinater, throw in the pork and you’re good to go. This can be made ahead and frozen, pork and all, for future use as well. 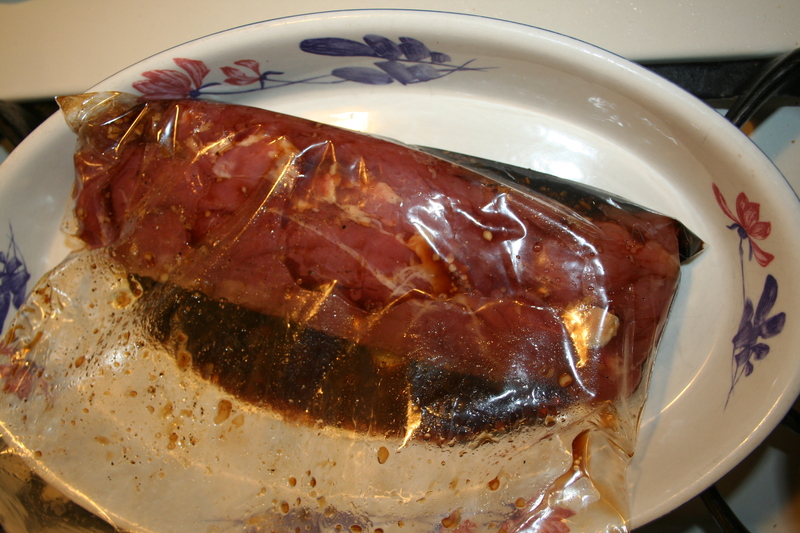 When I was pregnant with my third daughter, during my nesting or as I like to call it, panicking, I marinated and froze many different bags of pork, steak and chicken (different marinade for chicken, I’ll share it another day) ahead of time and we were able to use them for weeks and months afterwards. Hopefully this budget-friendly dinner idea works well for you too! ← So what are you doing this summer?